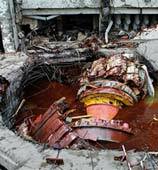 On August 17th, a powerful explosion ripped through the Sayano–Shushenskaya hydroelectric power station in southern Russia. Even as the public tried to make sense of the disaster, authorities mounted libel charges against one journalist, Mikhail Afanasyev, who tried to independently verify death counts, questioning the rescue effort and asking if living workers were still trapped in the wreckage. Writing for the Grani.ru online newspaper, journalist Vitaly Portnikov relates the way Afanasyev was silenced with the mass censorship of calamities during the Soviet Union, and resurgent government control over the media. Public safety, Portnikov argues, is just one of the necessary functions of the media that disappears when the press serves the interests of the government and not the people. I remember the first days after the Chernobyl disaster well. I wasn’t living in Kiev then, but wanted to visit my relatives for the May 1st holidays. The accident had already taken place, but it was absolutely impossible to understand what was happening: the official reports were patchy, Western radio voices were strenuously suppressed, and even they at first had trouble getting a sense of what happened. The May 1st demonstration resolved everything. It was hard to suspect that it could be conducted in a city that should, to be safe, have been evacuated. That was how I ended up in the post-Chernobyl Kiev. And after several days took ill with a heavy cold. Panic was already wandering the city streets, everyone was picking up [Radio] Svoboda and Voice of America, buying up red wine by the case. The doctors who visited me only shrugged their shoulders: what do you want, radiation, people are dying now like flies… They started washing the tram stops with soapy foam, parents tried to send away their children to relatives in other cities, even under threat of expulsion from the Party and dismissal from work. And so, in its throes, sneering over its subjects and scornful of them, the empire of lies, whose leadership would declare glasnost just a few months after the Chernobyl nightmare, was on the verge of death. And it seemed that all this would end forever. At least they wouldn’t hide catastrophes from the people. At least in the critical moments, the government would think not about a pretty picture on the television, but about human lives. It turned out that everything was just starting. The accident at the Sayano-Shushenskaya hydroelectric power station, and the willingness of authorities to crush the single(!) journalist who disputed the official version of events, presses this home with complete clarity. In recent years, many in Russia were sincerely perplexed, [wondering] why the crazy dissenters went to their marches, and independent journalists, instead of describing the color of Kseniya Sobchak’s underwear or the eyebrow movements of yet another high-ranking bureaucrat, tried to make sense of the authorities’ true intentions. As if these people didn’t live in the Soviet epoch and don’t understand what stupefying silence leads to. As if they don’t remember how one could only find out about plane crashes if they happened in the West, how those who tried to relate the execution of workers in Novocherkassk were arrested, how they suppressed the truth about natural disasters, hunger, emergencies. Ultimately, Chernobyl was the end and not the beginning to the lies. In that same Ukraine in the 30s, newspapers merrily recounted the successes of agriculture to their dying readers in the epoch of the Holodomor. Then, already after the war, an entire section of Kiev went underwater when the authorities tried to backfill Babi Yar, with its hated memory of murdered Jews, and erect a dance floor in its place – and again, to speak about this was anti-Soviet agitation. They have found just about the same clause for journalist Mikhail Afanasyev. I’m not one to judge the truth or exactness of his information about the possible victims of the accident. I won’t even say that this person is saving the honor of the journalist profession. At least because the workers of the official Russian media and those close to them, who lie to the people daily about what happens in their own country and the world around it, aren’t journalists at all: they are ordinary grey bureaucrats, working for their ration in prescribed conditions. Were there a different society, then journalists would appear. But in order for this to happen, Russia’s citizens must themselves feel the necessity for honest journalism, which thinks about them, and not the authorities. Not for the sake of abstract freedom and democracy, but for the sake of ordinary safety. So they’ll remember about you, your wife, your son, your mother, when you end up the victim of nature, an accident, terrorism – and not just cast them aside, like soulless debris, for the sake of a pretty television report.